Thermal imager with a temperature resolution of under 50mK, with telephoto lens option, voice recording, high temperature option for complete professional analysis. 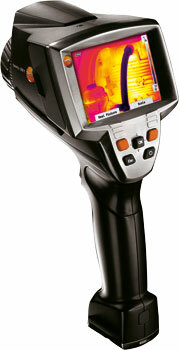 Thermal imagers can convert infrared radiation into electrical signals and thus render it visible. You can carry out completely damage-free tests on materials and components with the thermal imager Testo 881. This allows you to visualize problems in industrial maintenance and production monitoring before a malfunction or a fire risk occurs. With the Testo 881, you are on the trail of energy loss in building thermography, helping your customers to save expensive heating costs. With the new thermal imager Testo 881, you save time, energy and money in industrial thermography as well as in building thermography, and ensure more security allround.